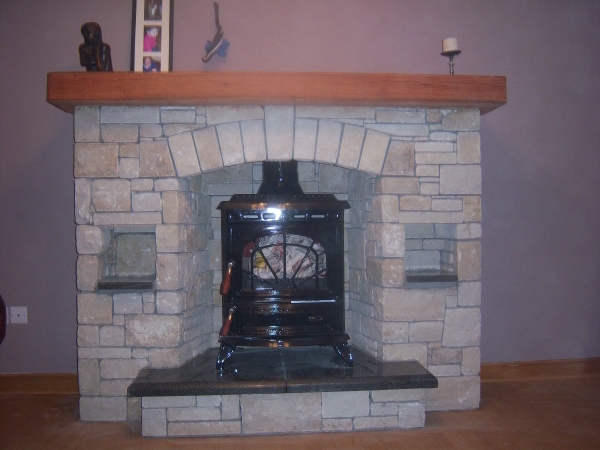 Fireplaces are the heart of the home and with some thought our stone cladding can also create the feature of the house as well, no matter what the size you are either looking to build or clad over. The cladding stones we supply are non combustible so no need to worry about them going on fire, you do however still need to follow local fire regulations. They are all especially well suited for use on wood burning and multi fuel stoves and can make a special feature wall when used behind a heating appliance. Eazyclad range of cladding stone consists of both natural and man made pre cast stone slips the natural is available in two forms stone cut from random building stone to a given thickness of 30mm which you attach to the wall in single slips and cladding panels which are basically produced to work like a large tile that fit together. The manufactured veneers are also available in 2 formats either single pieces of replica stone that once again you glue to the fire place surround in the same way as the natural stone cladding. The other cast stone comes in a panel form and is very easy to use. All our products come with a corner made from the relevant cladding on a 90 degree angle to give the full appearance to any building project you may be undertaking.